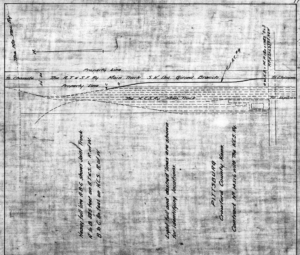 The drawings on this page are of track charts and junctions that can be found in the Temple Archives. These are just a very small sampling of the track charts, industry tracks and junction records in the Temple Archive. 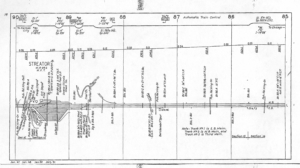 The track charts on this page are all of medium-to-large yards. To see the full-size image, click on the thumbnail. Track Charts. These track charts are circa 1950-1951. 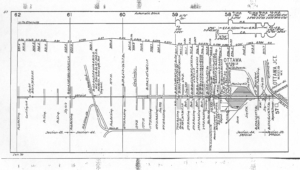 Track Chart Burlingame, KS, circa 1952. Burlingame was on the First district Eastern Division. R.L. Crump/Priest Library, Temple Archives. 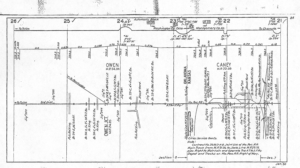 Track Chart Caney, KS, circa 1952. 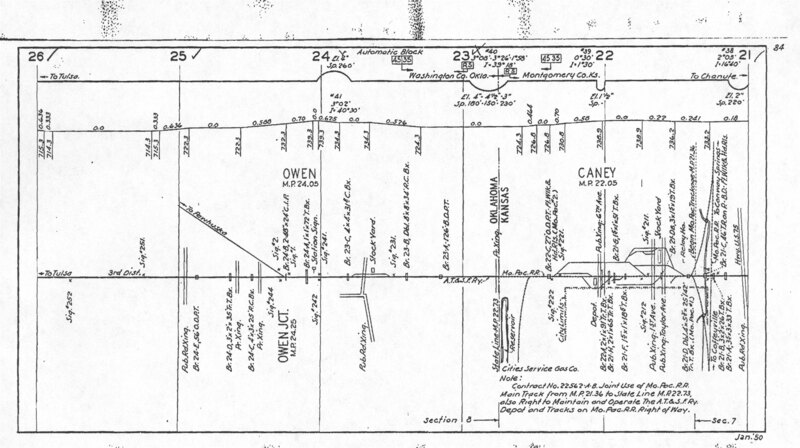 Caney was on the Oklahoma Division’s, Chanute-Tulsa Line. R.L. Crump/Priest Library, Temple Archives. 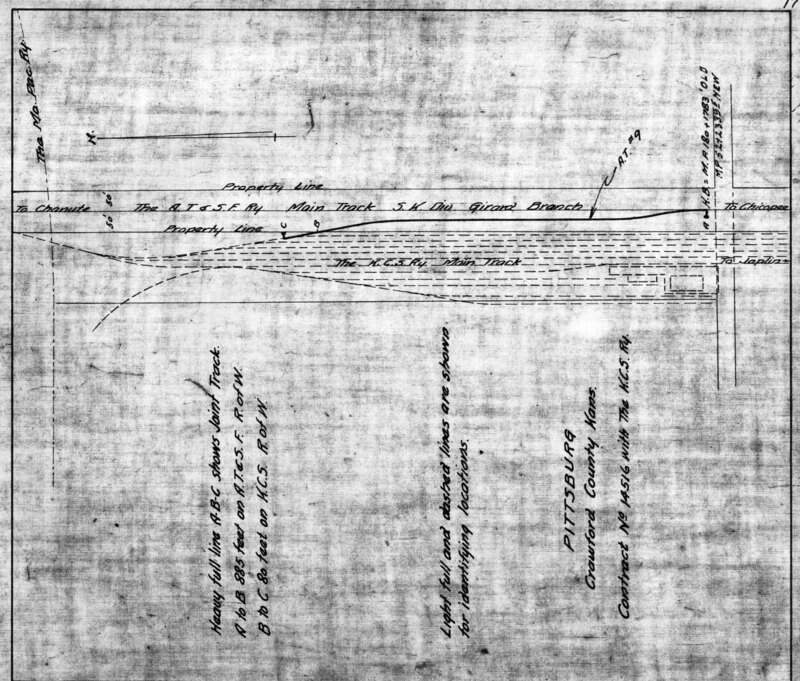 Track chart Streator, Ill. R.L. Crump/Priest Library, Temple Archives. 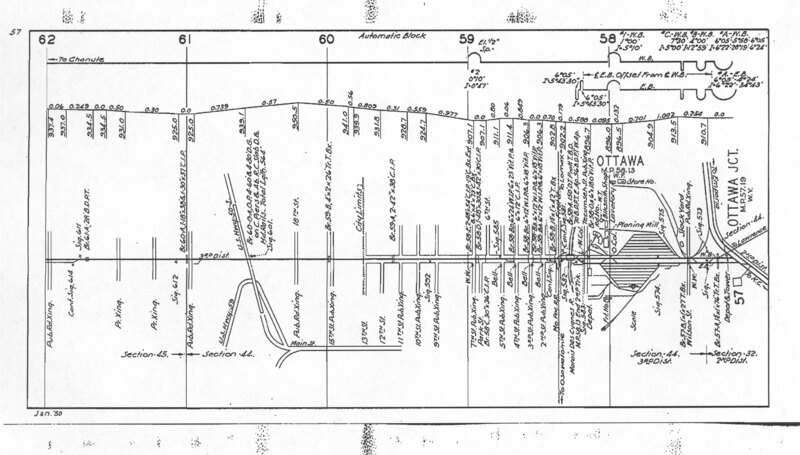 Track Chart of Ottawa and Ottawa Junction on the 2nd District Eastern division circa 1952. R.L. Crump/Priest Library, Temple Archives. Junction Records. These junction records date from the mid-1930s. One record from each Grand Division is presented. To see the full-size image, click on the thumbnail. 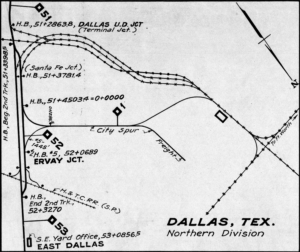 The Northern Division’s Dallas District has several junctions in Dallas with the Houston and Texas Central (SP), the City Spur, and the Dallas Union Depot tracks. 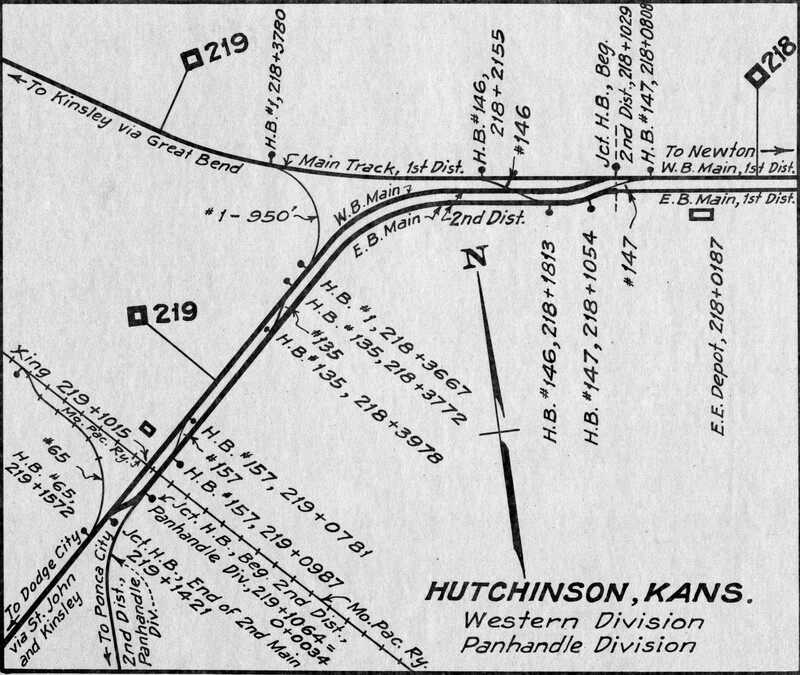 Hutchinson is the junction of the Western Division’s First and Second Districts and the Panhandle Division’s Second District. Joint Facilities Records. Joint Facilities Records are in two forms. 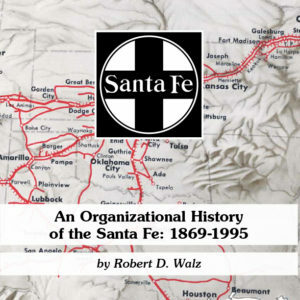 There is a listing or an index, which is covered in Santa Fe company documents, and a line map. 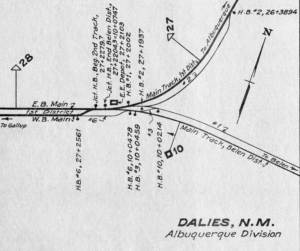 The maps show the track layout and/or buildings in relation to Santa Fe tracks, the contract number, and and who is responsible for maintenance in each part of the facility. A small sample of these records is shown here. To see the full-size image, click on the thumbnail. 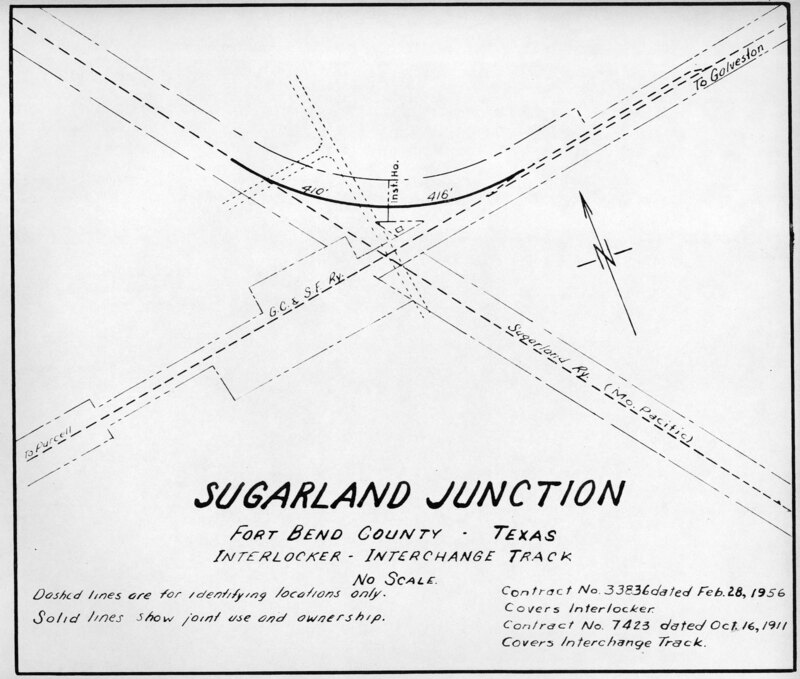 Joint Facilties Record Sugarland Junction, Texas, map, June 1, 1975. 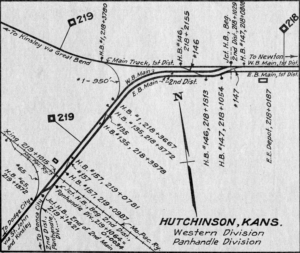 Joint facilities Record Billing List Eastern Division Pittsburg Kansas, and KCS corrected to December 31, 1969, p. 2. Industry Tracks Records. Industry Track Records are also in two forms. 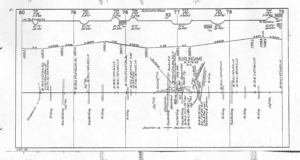 There is a listing which is covered in Santa Fe company documents (Western Lines) or an index (Eastern Lines and Gulf Lines) and there is a line map. 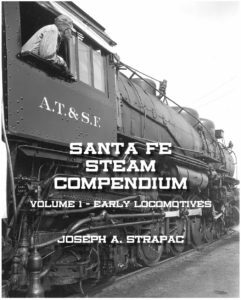 The Coast Lines listed the industry tracks as a table as a part of the Side Track Records. 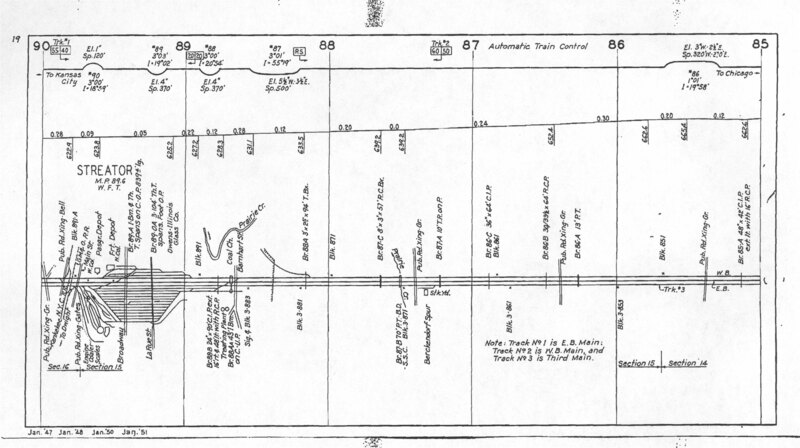 The line map was an appendix to the contract governing the industry track. 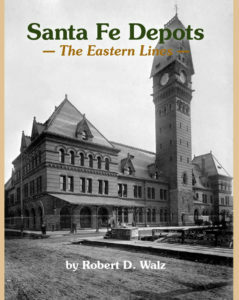 The records were maintained by the division engineer and kept up to date. 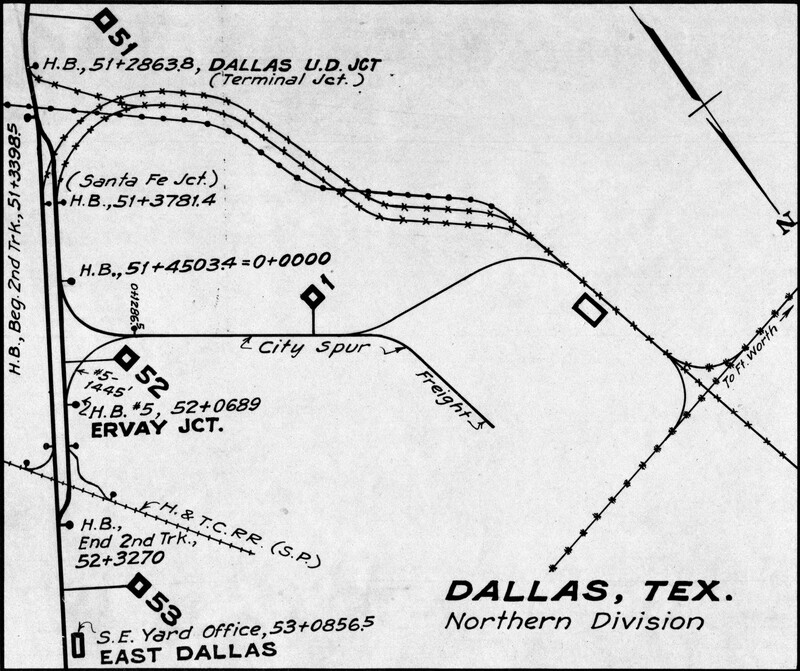 The Eastern and Western Lines maintained the maps for each industry or spur. 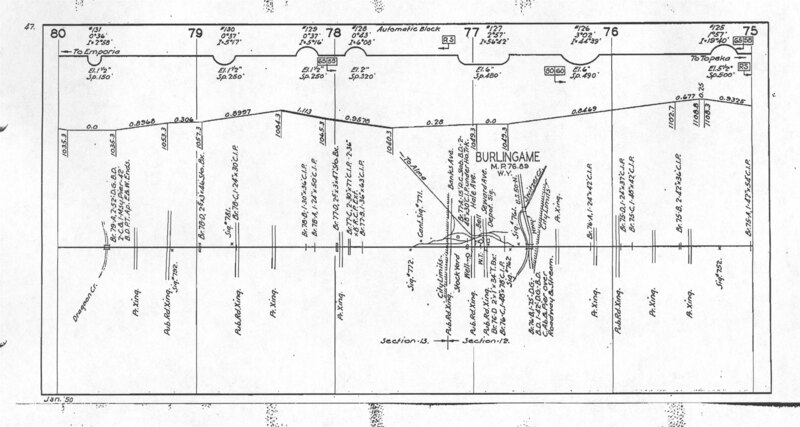 The Gulf Lines maintained maps of all industries in an area. 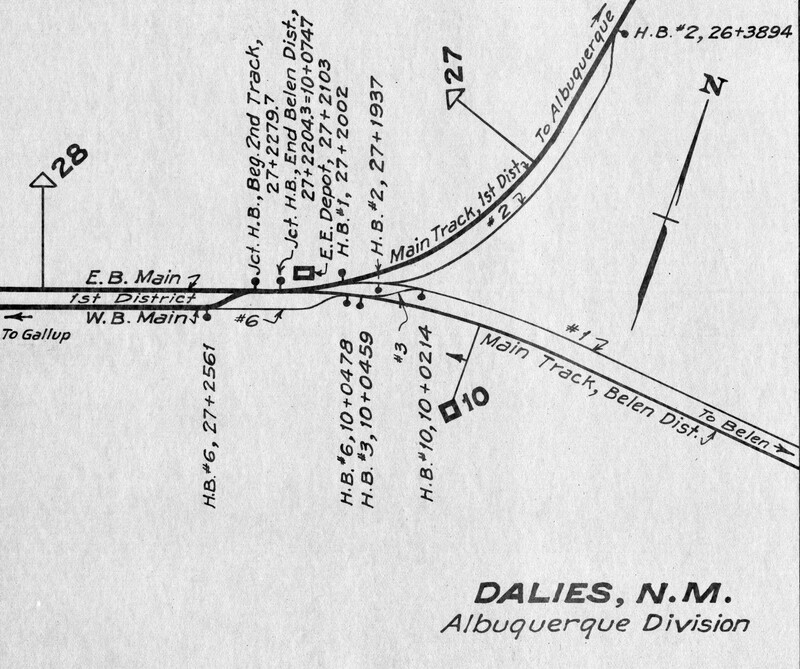 The maps show the track layout in relation to Santa Fe tracks, often a footprint of the industry or industries, the contract number, and who is responsible for maintenance for each part of the track structure. A small sample of these records is shown here. To see the full-size image, click on the thumbnail. 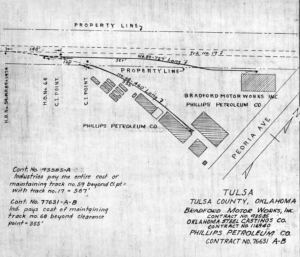 IndustryTrack Record Bradford Motor Works, Oklahoma Steel Castings, Phillips Petroleum Co. Tulsa, Oklahoma, Dec 31, 1969. Bradford Motor works was a distributor of small industrial items. Oklahoma Steel Castings made steel castings, Phillips Petroleum had a bulk dealer here. 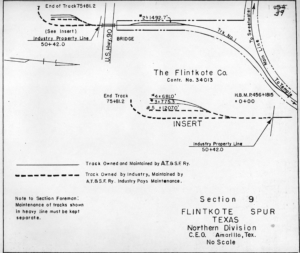 Industry Track Record, Flintkote Co. 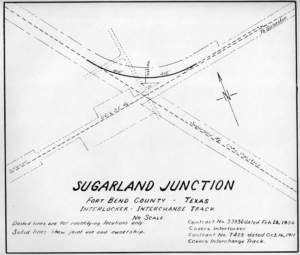 Spur, Texas, corrected to June 1, 1976. 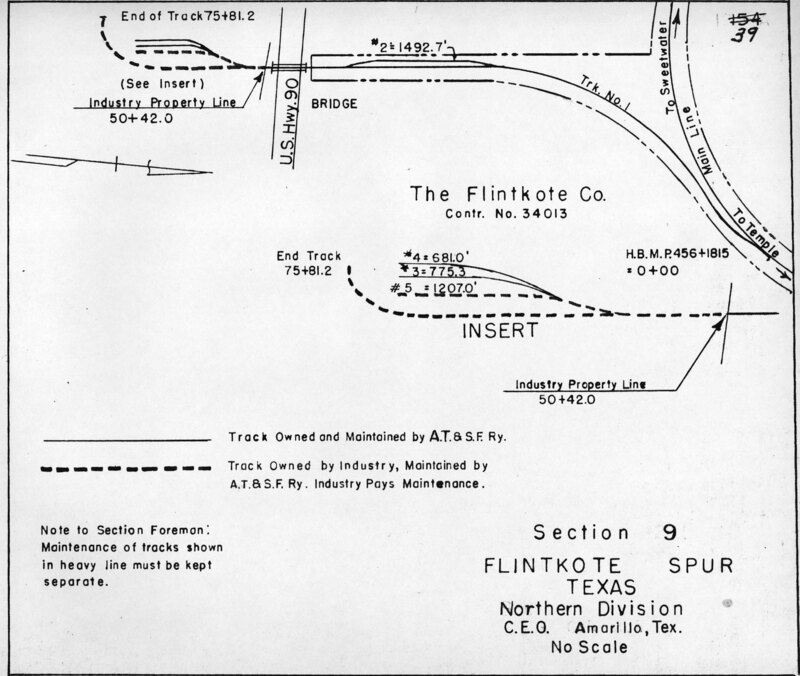 1901 was the year that the Flintkote Company was established as a manufacturer of roofing materials.